In February 1862, General Mansfield Lovell sends reinforcements to Albert Sidney Johnston, the chief Confederate commander in the West, so he can defend Nashville and Fort Donelson. 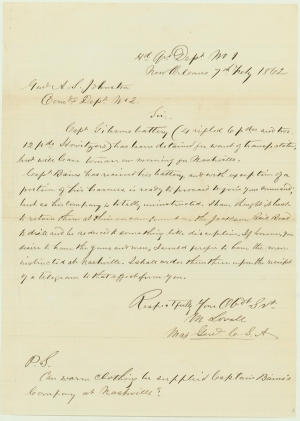 The move was fruitless; Fort Donelson fell to Union troops a week after this letter was written. MANSFIELD LOVELL. Autograph Letter Signed, to Albert Sidney Johnston. New Orleans, La., February 7, 1862. 1 p., 8 x 11 in. 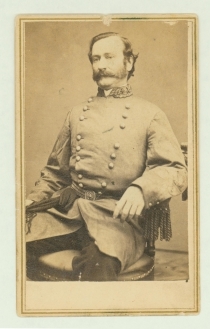 With: a carte-de-visite of Lovell in Confederate uniform. New York & Washington: Brady’s National Photographic Portrait Gallery, [ca. 1862]. A day before Lovell wrote this letter, Ulysses S. Grant had forced the surrender of Fort Henry, Tennessee. The loss prompted Confederate Western Department commander General Albert Sidney Johnston to abandon his position at Bowling Green, Kentucky and fall back towards Nashville. A week later, on February 16, Fort Donelson, Tennessee, fell. The Cumberland and Tennessee Rivers had been opened, and all of western Tennessee, northern Mississippi, and northern Alabama were exposed to Union invasion. Johnston adopted the strategic thinking of P.G.T. Beauregard, his new second-in-command, and concentrated most of the men in the western theater on a climactic battle against Ulysses S. Grant. In the resulting Battle of Shiloh, (April 6-7, 1862) Johnson himself was killed. He was the highest-ranking officer to die in battle on either side in the Civil War. In the aftermath of the Battle of Shiloh, New Orleans lay exposed to Union attack from the north, while to the south, Admiral David G. Farragut’s Mississippi River fleet broke the Confederate defenses on the Mississippi River at Forts Jackson and St. Philip. The two forts protected New Orleans, but Farragut bypassed them in the dark, early morning hours of April 24. He then prevailed over Confederate Captain John Stevenson’s overmatched fleet. Lovell began to evacuate New Orleans over the next few days, well before Union General Benjamin Butler’s army was in a position to threaten its works. Lovell’s evacuation order probably cost him his career; he was investigated by a court of inquiry and never again commanded troops in the field. Butler occupied the Crescent City on May 1. Mansfield Lovell (1822-1884) was a West Point graduate from Washington, D.C., who was seriously wounded at Belen Gate in the Mexican War. In October 1861, he was appointed major general in the Confederate Army and assigned to command in New Orleans. Under Lovell, the Confederates lost New Orleans, but he was hampered by deficiencies in men and materiel and was subsequently cleared of responsibility. However, he never again obtained high command. Albert S. Johnston (1803-1862) of Kentucky graduated from West Point, where he befriended Jefferson Davis, in 1828. He went to Texas, where he served as aide-de-camp to Sam Houston’s revolutionary army, and rose to command Texas forces briefly in 1837. He also served as Secretary of War for the short-lived Republic of Texas. Johnston fought under Zachary Taylor in the Mexican War, was colonel of the 2nd U.S. Cavalry on the Texas frontier, led troops in the Utah wars, and commanded the Department of the Pacific before the Civil War. In 1861, he was appointed full general (second after Samuel Cooper) with command of all Confederate forces in the western theater. Under his overall direction, the South lost Fort Henry and Fort Donelson. His plans for resurgence in the West resulted in the Battle of Shiloh, during which he fell mortally wounded. Very good. Small chips at top margin, two minor tears at left margin, ink identification on verso.